A couple weeks ago, Ms. Heather McGhee, of Wurth Electronics Midcom, wrote to me asking about getting a listing on Vendor pages for which her company manufactures products. I obliged accordingly by adding Wurth Electronics to the Automotive & Vehicular Electronics, Capacitors, EMC / EMI / RFI, Hardware, Inductors, and Substrates / PCBs pages. 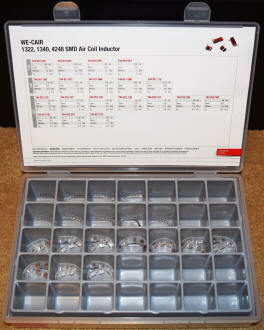 For Sale: Würth Electronics SMD 0402 Multilayer Ceramic Capacitor Design Kit, SMD Air Coil Inductor Design Kit, and Power Elements Design Kit. 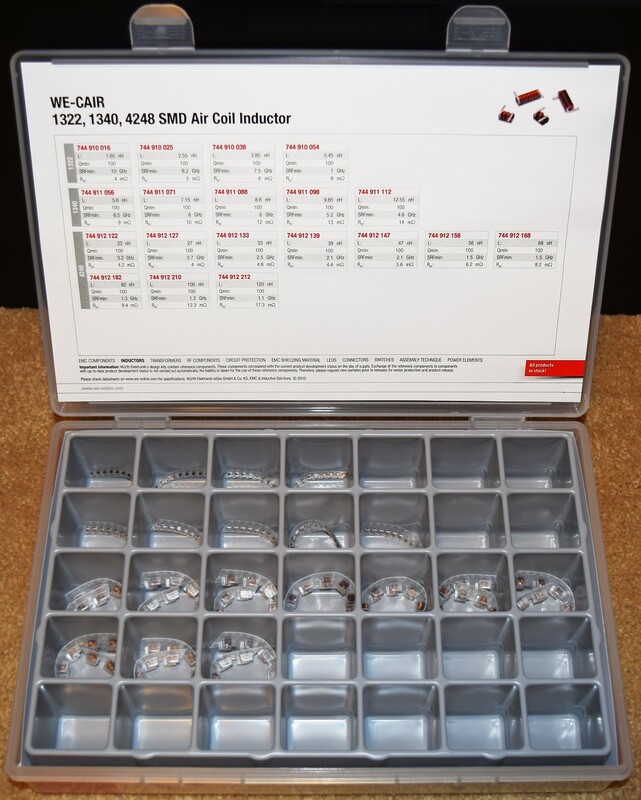 These are the kits - all unused - graciously provided by Würth for a product review. I have no need for them at this time, so this could be your lucky day. 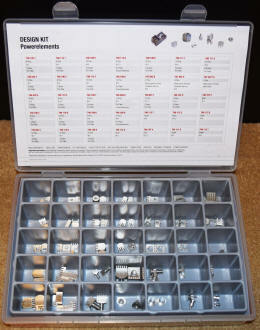 They sell on Digi-Key for about $110 each, but you can buy the group of three three kits for a total $75 (~$330 value) + shipping (U.S. locations only). The first person to e-mail me gets them. thanks. Wurth Electronics Midcom, if you are not familiar with the company, is part of the Germany-based Würth Elektronik Group companies. Combined, they produce thousands of circuit board-based system components for power distribution, display and control panels, electronic controls. Power magnetics, EMC components, common mode chokes, capacitors, transformers, RF inductors, high current PCB terminals, printed circuits boards, terminal blocks, automotive magnetic components, electronic displays, LEDs, control units, and keypads are among the offerings. 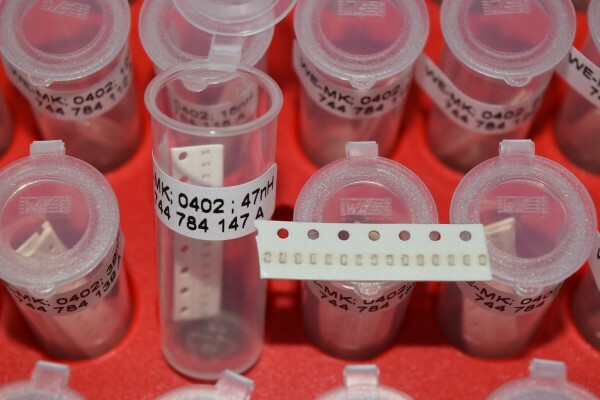 Surface mount and through-hole packages are available. They offer FREE samples of catalog items on request. 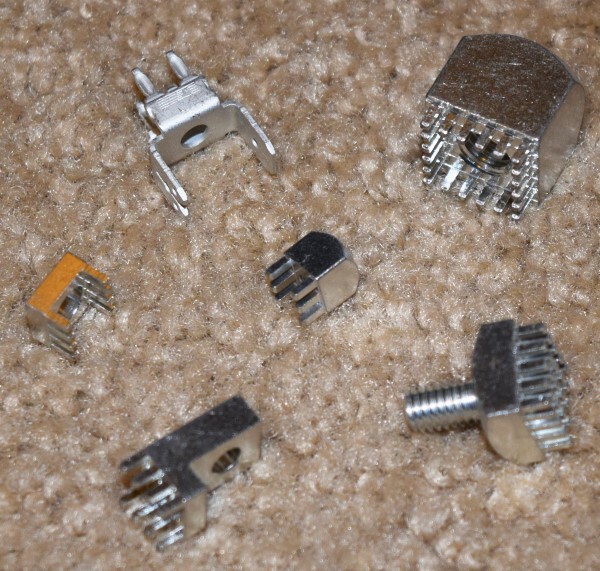 In fact, Heather graciously provided to me Design Kits that included surface mount inductors from the Automotive (iBE) group and high current PCB-mount terminals from her Midcom group. There are at least 50 really nice Design Kits available with various types of inductors (air, ferrite core, ceramic, SMD, through-hole, etc. ), power line chokes, LAN interface transformers, EMI suppression ferrites, a huge variety of shielded and unshielded connectors, ESD suppressors, varistors, fuse holders, DC connectors (think wall wart interface), SEPIC converter, and beryllium EMI finger type contacts. The web page descriptions all say "free refills" for the kits - what a deal, eh? Below are photos I took of the three kits sent to me. If you would like samples of your own, please contact Heather. Why be Würth-less when you don't have to be? To quote Linus van Pelt in a Peanuts comic panel where he decides to run away from home while carrying his pack in the wrong direction, "I feel not unlike a fool." 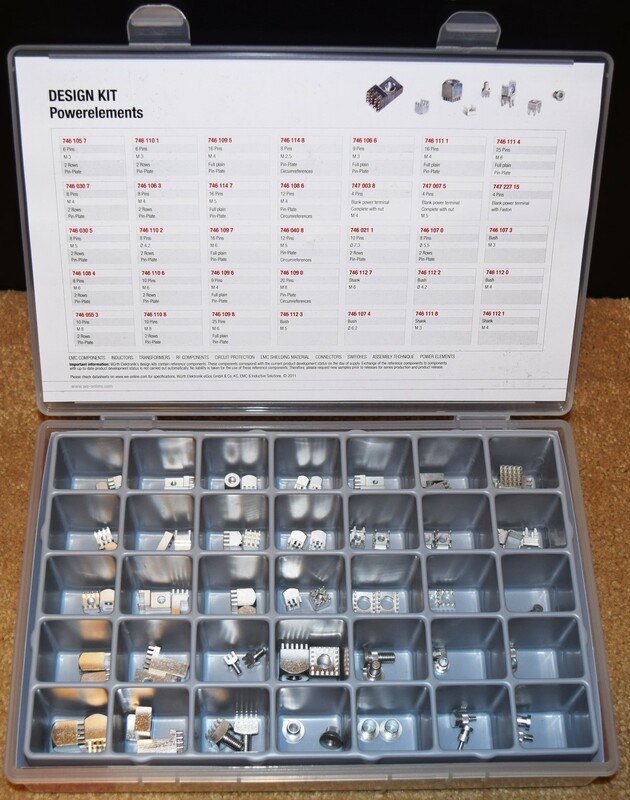 When I first opened the Power Elements design kit I thought all the nifty looking machined metal pieces were heat sinks. As it turns out they are circuit-board-mounted blocks that are meant to be screw-down connectors for high current interfaces. They are very well made. I'm more likely to eventually 'repurpose' a couple of them as heat sinks than use them as intended. Another great use for them would be for some artistic type to incorporate them as components in some form of creative sculpture like these Winged Insects from Electronics Components and Electronics Art. One more thing. Coincidentally, Ms. Lorie Nichols, editor of In Compliance magazine, contacted me today about something and while looking at the website, I noticed a item titled "Wuerth Elektronik eiSos and Formula E Sponsoring."